Another in the line of Kelsey Excelsior presses. William A. Kelsey began making inexpensive presses for amateurs in 1872, and his Excelsior became the longest lasting-press on the market. For more information, see the Excelsior Model P page. 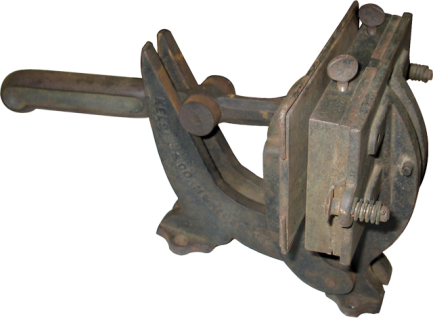 The Excelsior shown above is a trunnion-type lever press, whose lever is attached to two wheels that roll along the track-like sides of the press as the press is opened and closed. Patented in 1873, this trunnion-type model was one of the earliest presses in the Excelsior line to be sold; the Excelsior would soon evolve into a self-inking press in many sizes, one of the most popular lines of presses ever manufactured.